We can restore your blower back to its original condition with our positive displacement blower repair services in Orlando, FL. Positive displacement blowers have been used for many years in a variety of different commercial and industrial locations. Just like many other machines, this type of blower has also gone through a series of technological changes to enhance its performance abilities. If you use a positive displacement blower, you likely enjoy the power and enhanced abilities this type of blower provides. However, due to the advanced capabilities and innovative features of this type of blower, you may not know what to do when your blower no longer works like it should. 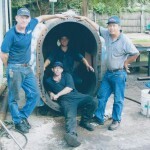 When this happens, at Pat’s Pump & Blower in Orlando, Florida, we can restore your blower back to its original condition with our positive displacement blower repair services. When it comes to positive displacement blower repair, you can count on us to fix your blower quickly and correctly. We have been providing blower repair services since we opened our doors in 1985, and we are highly knowledgeable regarding how this these blowers operate and what kind of repairs they might need. If you turn to us for positive displacement blower repair, you can count on us to repair it right the first time, so you won’t end up with a blower that won’t work when you go to use it after that. Even if it’s after business hours, don’t hesitate to call us at Pat’s Pump & Blower for positive displacement blower repair services. To provide the highest level of customer service possible, we are available 24 hours a day.